Sorry I didn't finish up writing about my last trip sooner! Things have a been a little busy at home lately. 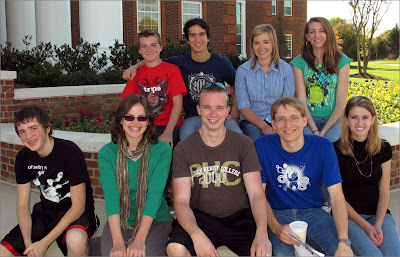 We got out on the Chesapeake Saturday, the day after visiting NOAA, and we all had a lot of fun. There wasn't much wind, but it did pick on later on in the day. It was good to get out on the water, even if it was just in a Cal 22 for a few hours. We sailed around for four hours or so and then headed home. around all that long and it was neat to see how much its grown over the years and everything that the students there have done to help make it what it is today. It didn't take long to get a tour of the small campus, then we spent awhile just chatting with some of the students from there. We then headed off to get a late lunch and head back to the hotel. It was also my little brother, Toby's, birthday. So we went out to dinner later that night. 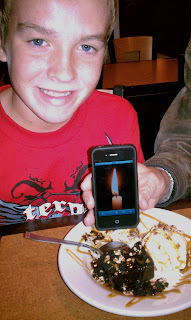 They didn't have any birthday candles at the restaurant so Scott downloaded a candle app on his iPhone. Next day was NASA. We spent the whole day there being shown all around. went well, even though at first the slides on the computer wouldn't work. It was a good day there, but rather then writing all about it, I'll post a bunch of pictures from that day. Tuesday was the day we were flying home, but we weren't flying home till later so we decided to head over to the Annapolis Yacht Club and look around down there. While we were over there we walked over to the the Naval Academy. That was a pretty cool to see. I wish we had had a little more time but it was getting late so we headed off to the airport. It had been a good, but long week and Toby and I were both looking forward to going home. Great reading and lovely photo's. You are certainly having a good time. Continue enjoy life. Any new plans on future adventures? Nice pictures Abby! 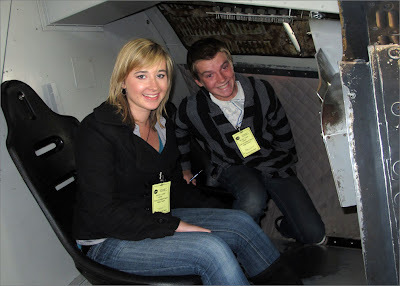 Your NASA visit must have been quite an educational one and a fun one. Looking forward to hearing about your next journey. Always enjoy hearing from you Abby. 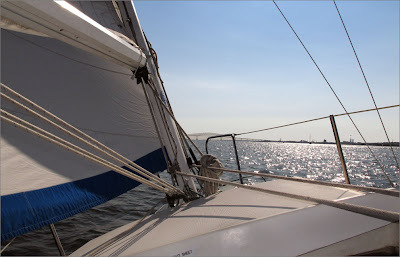 It was great that Scott could organize a sail on the Chesapeake. And I loved the digital candle for Toby...that ice cream and brownie looks...yummy! As today is Veterans Day in the USA and Remembrance Day here in Canada we honor those who have given their lives in serving their country and helping other nations. PEACE. I have had lots of fun reading your blog today (as usual:). Above all you sailed again (your dreams will never finish!) and I really like all the photos you posted. Especially "Toby's digital birthday candle"... HAPPY BIRTHDAY TOBY!! Nevertheless, "Toby, the astronaut" is pretty! Continue in this way! 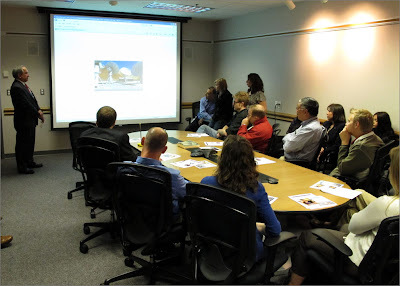 Thanks Abby for sharing your current activities with us. I check your blog every time I get on the Internet. The digital candle made me laugh. Would you please give us an update on your book either on your blog or on your website? I am eager to read it. It will also make a great Christmas gift. I love space, and wish I could go, like right now. Hey, was that one of the Harris twins? so cool that you got to see them! My guess is that you have the chops to maybe even influence NASA's budget with your exceptional ability to instill such galvanic excitement about the continued exploration of mankind's frontiers. Thank you for the pics. My fav was the first. Funny how a picture of the sea from over a bow can set the mind a dreamin/wishing, so a special TY for that one! A Cal 22 huh? I'd settle for a Sunfish, just to be sailing! But not in the chilly H2O of the Chesapeake Bay (currently 54º F). I prefer SoCal myself. Did ya get any more pics of the day on the bay? GOD bless you and yours, and fair winds to ya my friend! It really is fantastic how you never forget anyone in your posts - not even forgetting to mention your fans! So thanks Abby! Take care, Enjoy! Hi Abby: Love your blogs and the adventures you are experiencing. Its great at your age to see and do all that you are doing. It looked like your brother Toby had a fun birthday. Real cute pictures. Thanks again for sharing. We will keep following you. Grandad & Grandma in West Los Angeles, CA. Sounds like you are having fun in all your adventures. Wow! I just stumbled across your blog and am totally amazed by you. How sweet is it that you not only have an awesome dream but that you are actually doing something about it. Good luck to you Abby, I know you can do it! I hope and pray that ye have a tremendously terrific Thanksgiving! As for me? I must go now to the sea again. To the lonely sea and sky, and all I ask for is a tall ship and star to steer her by. Remember Skipper: God promises a safe landing— but not necessarily a calm passage. Amen? Fair winds to ya matey. you are really a brave girl which seems to have a lot of fun in all her adventures! We wish you the best of luck for all the future ones! Sailing is our passion and we are impressed of your sailing tour. It has been a while since you left Wild Eyes. We all lost track of her some months back , but she is out there drifting around the place but we can't locate her. Did you leave your gear operating so we can locate her by Sat? The weather will be great soon and perhaps we could go an locate her and bring her back to Perth. drop us a contact here and we can see what is possible. You are one of the most inspirational people I have ever heard of in my entire life. 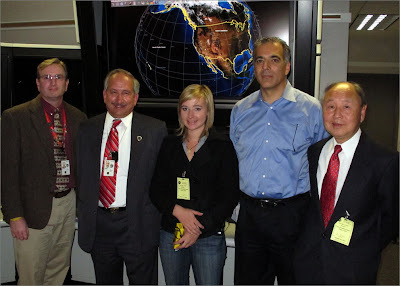 It is my dream to someday work for NASA and be a totally awesome scientist. :) Hearing about how you are getting out in the world and achieving great things inspires me to do the same. So, thank you. Thank you for being you and not backing down to the adventure of life!! that's so cool you went to nasa! you brother toby is adorable! love the digital candle lol. i like reading your blog. Finally getting a chance to catch up on your blog. Glad to see you're still posting and still sailing. I'm enjoying reading about all of your new adventures. Wow!! 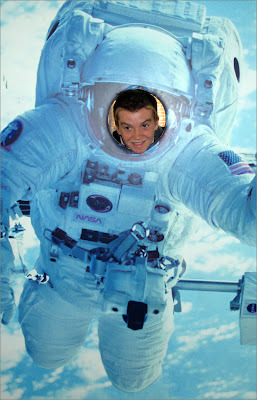 I,ve always been fasinated with NASA!! Your a luck girl!! Anamous, About the Harris twin. I was wondering myself. Think it's Alex. Don't quote me, though.For those of you who don't know, ALex and Brett are two really cool guys. Check them out at www.therebelution.com. Good to read abt you, Abby. Just finished Unsinkable . Wanted to stop by and say you are an amazing young lady. Can't wait to see what God and you do in your life next. Good Luck to you on all lifes adventures.